Little Red Riding Hood party planning ideas. Fun ideas that will bring the classic children's tale of Little Red Riding Hood to life with these ideas for games, activities, invitations, decorations, food, favors and goody bags. We've also included our favorite Nature Scavenger hunt with a free item list to print out for the kids to enjoy when they are in the "forest". 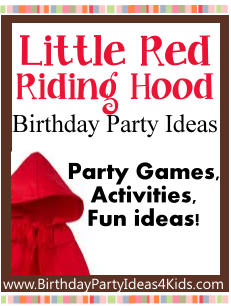 Invitations for the Red Riding Hood party can be as simple as using a blank solid red note card and filling in the party information on the inside. Dress it up a little by using white and red polka dot cards. On a red note card attach a piece of red fabric (smaller then the inside of the card) at the top so that it covers the party information. The guests will have to lift up the fabric to see the details. Decorate the birthday party like a wooded area. Use real or fake plants around the area and / or cut out paper trees from butcher block paper to hang on the walls. On the walkway leading towards the entrance trace wolf paw prints with sidewalk chalk. Place a big sign on the front door that reads "________ Woods" and fill in the blank with your last name. Make another sign pointing away from the first that says "Grandma's House". Around the party area hang signs that say "Beware of the Big Bad Wolf". Tables can be decorated in red and white checkered table cloths with solid color red plates and white flatware and napkins. Place red and white striped straws in a pretty clear glass on the table by the drinks. Red helium balloons tied to the backs of chairs at the birthday party table and all over the party area - tie them to a mailbox to show guests where the birthday is happening. An accent color such as light blue or yellow will compliment the red of the party. Serve food in wicker baskets. Topiaries covered with vines or red roses. Hang red paper lanterns from the ceiling around the room. 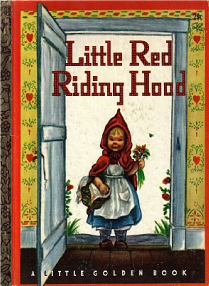 Have a fun Nature Scavenger hunt as Little Red Riding Hood tries to find Grandma's house. Complete with a free item list to print out and directions. Have a big treasure hunt to find and fill a basket full of goodies as Red Riding Hood makes her way to Grandma's house. Before the party hide small toys and wrapped candy outside or around the inside party area. Give each birthday guest a red sack or small basket (can be used also as a goody bag to hold favors after the party). Let them search for items and keep the ones that they find. For extra fun you can buy plastic food items and label each of them with a different number. Buy prizes and assign each prize a number that corresponds with the plastic food. When the guests find a plastic food item they can turn it in for prizes after the treasure hunt. To make the Red Riding Hood Treasure Hunt fair for smaller children let the kids be allowed to collect only one plastic food item during the hunt. Buy or make a large piñata in the shape of a wolf or wolf's head. Let birthday guests take turns trying to break the wolf. You can use a stick or a plastic ax to hit the piñata. For tips on Piñatas see our Piñata help page. Let the guests help make red capes that they can use during the party. If the guests are too young to help make the capes at the party - have them already made and let them decorate it with fabric pens or markers. Decorate some cookies for the kids to take to Grandma ... or take home as a party favor. Before the party bake or buy large sugar cookies. Set out different frostings, sprinkles and candies and let guests decorate cookies to take home. Played just like Pin the tail on the Donkey except use a poster of a wolf instead. You could also play the game by pinning on large ears or teeth to the poster. Have an adult dress up like a wolf and play tag with the children. Or let the children take turns being the wolf - buy some large fuzzy ears or a wolf mask that the kids can take turns wearing. Have an adult or older sibling dress up as a wolf. Give each guest a can of silly string and let them try and capture the wolf with their silly string.